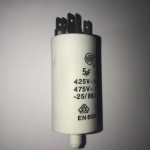 Replaces the ICAR Ecofill Capacitor Used In Stuart Turner Pumps. Does your Stuart Turner shower pump make a humming or buzzing noise or fails to switch on? Do you have to turn on another tap or place your shower hose at the bottom of your bath or shower to start your shower pump? The most probable cause is that the Stuart Turner capacitor has failed and needs replacing. 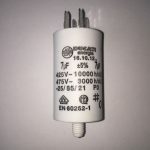 To replace the capacitor is a simple job which most experienced, diy-ers or practical persons could do in a matter of 10 minutes. 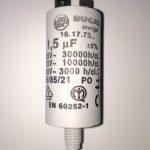 Our capacitors for Stuart Turner shower pumps are heavy duty, long lasting and high quality. Please do not install cheap, inferior chinese import parts as you will be back to square one with your shower pump problem. 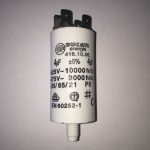 There are many capacitors out there online, many are cheap imports imported from china. 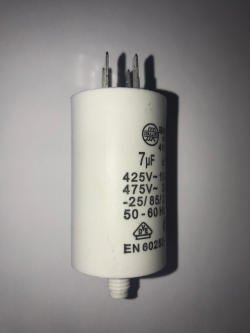 What many diy-ers do time and time again is fit fluorescent light bulb capacitors, these are not heavy duty and for light bulbs only. You must install the right capacitor for the job, we only sell heavy duty, long lasting capacitors which are superior quality. Most shower pumps range from £100 upwards and will last many years if the correct parts are fitted. Don’t waste your valuable time installing the wrong parts or you will be forever carrying out work on your shower pump. These Motor Run Capacitors will fit obsolete or discontinued Stuart Turner shower pumps. Grohe Aktive 75 Shower Pump, Mira Enduro, Rada Thermotap-3s, Stuart Turner whirlpool 5160 5190, Stuart Turner Boostamatic 194, Stuart Turner Boostamatic Es330 Es500, Stuart Turner Cfl 194 Automatic Flow Switch, Stuart Turner Monsoon 1.5 & 3.0 Bar Twin, Stuart Turner Monsoon Extra 1.2 Bar Single, Stuart Turner Monsoon Extra N1.2 Bar Single, Stuart Turner Monsoon N1.5 N3.0 Bar Single, Stuart Turner Monsoon N1.5 N3.0 Bar Twin, Stuart Turner Monsoon N4.0 Bar Twin, Stuart Turner No 903 253, Stuart Turner Pond 17 21 29 35 Isis 17 21 29 35, Stuart Turner Showermate 1.4 Bar Twin 1.2 Bar Single 1.8 Bar Twin Special Export, Stuart Turner Special Jetforce 75 (mk6) Jetforce 55 (mk6) Trevi 45 Twin Aktive 75 St55, Stuart Turner Special Newteam Mk3, Stuart Turner Special Sb52, Stuart Turner Special St55 Single. Please Note! Please make sure you order the correct parts, if you are unsure, please email us for help. We do not accept correctly supplied electrical goods for return, refund or exchange. 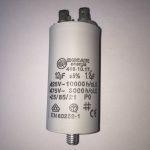 A Stuart Turner Capacitor is tested before dispatch and cannot be accepted back for refunds.